This level has hard difficulty. 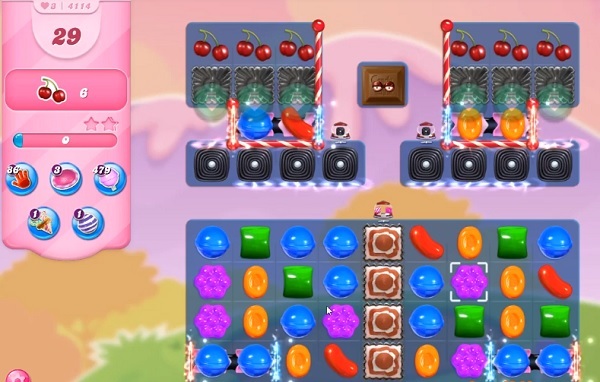 For this level try to play from bottom part of the board and make special candy. Combine them with each other and use more striped candy to move the ingredients to take them out from the board. Just wondering when you are going to fix this level? All the above videos have more moves to start, my game only has 20, and also, I have icing covering the upper blocks. I cant possibly feed the frog enough to break through these blocks in 20 moves. Another impossible level. Yes I think if had 29 moves and only 1 layer of icing I could complete this level too. Instead I only have 20 moves and double layer of icing I don’t seem to be able to complete level 4114. Please make it fair. I only have 20 moves and double icing layer, and its imposible to beat, been playing this level 2 weeks already i think this level can make me stop playing and delete this game. I only have 20 moves? Please fix. These so-called tips are becoming increasingly more useless as King Games works on making levels less fun. 20 plays instead of 29?! I don’t mind a challenge, but most of the changes border on ridiculous.